Dry Stone Walling Across Canada is pleased to announce the winners of the fourth annual DSWAC dry stone walling 'Dryscaping' competition and to continue showcasing quality dry stone work in Canada. Mike Melo, Brian Bailey and Patrick Callon collaborated on this lovely dry stone structure which was a design of Patrick's. They win the 2011 DSWAC Canadian Dryscaping Award, a competition which was held this year to acknowledge the best design and build in Canada for a dry stone work completed by October 2011, in the category of ' dry stone enclosure'. This is the fifth year that an award (and a small monetary prize) has been given out by our organization. Wallers who win this prize are chosen on the basis of photos of their recent projects submitted by email to the DSWAC. The entries are looked over and the stone project that we feel displays the highest standard of craftsmanship in the category for that year is chosen and is announced the first week in October, at the Canadian Thanksgiving Dry Stone Wall Festival. Congratulations to Mike Brian and Patrick of London Ontario for their fine work. All three men participated in the Rocktoberfest amphitheatre building project this year and Mike Melo accepted the award on behalf of all three wallers. Next year's 2012 Dryscaping Award category will be posted on the www.dswa.ca site shortly. The DSWAC Acknowledgment of Achievement Winner for 2009. The first ever, dry stone outdoor 'fireplace' contest was held by the DSWAC to encourage the building of interesting dry stone structures designed to be used for cooking and warmth. 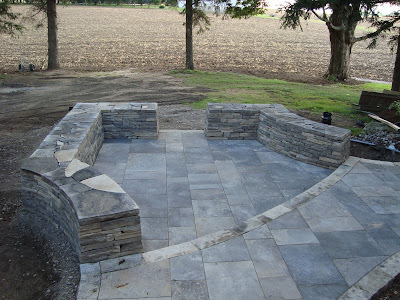 Stephen Nevin of Oakville, Ontario won the first prize for his entry shown here, for 'Best Dry Stone Installation Creating a Fireplace, Firepit or BBQ'. Stephen was notified of his winning the contest while attending the lectures and presentations on the Sunday night of the 3-day Dry Stone Wall Festival in Grand Valley Ontario in October 2009 on the Canadian Thanksgiving. Stephen received 500 dollars. The DSWAC Acknowledgment of Achievement Winners for 2008. Work which was considered for 2008 had to be work started in Canada in 2007 and completed by September 2008 at the latest. Any Dry Stone Wall (built by any group of individuals, professional of non-professional) was awarded to Reid Snow who also accepted the award on behalf of Marilyn and Darryl Spencer and Bob Waller who worked on this charity fundraiser project near Orangeville, Ontario. The Non-Professional Wall prize has been awarded to Brandon Spearing for his beautiful dry stone fire-pit constructed at his parents' farm near Bethany, Ontario. Special mention should be given to Tom Jackson for his work with two young offenders at Brookside in Cobourg on this elegant dry stone wall built last year at the main entrance.